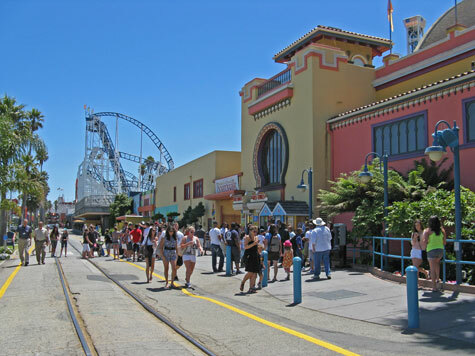 Santa Cruz California is a popular resort community located 72 miles south of San Francisco. Situated on Monterey Bay, the town features beautiful sandy beaches and some great scenery. Famous city landmarks include its exciting beach boardwalk and municipal wharf. Attractions include the Neptune Casino, Giant Dipper Roller Coaster and the natural natural bridge. Plenty of hotel accommodation is available in Santa Cruz but reservations are often needed. The nearest major airport to Santa Cruz in the San Jose Airport. SFO and OAK are further north.